Observing Left liberals is a favorite pastime of mine. Given the fact that I am Right of Center in my dispensation, I like to track and understand the opposing view. To paraphrase Russell, I make it a point to read the views of the people who I don’t agree with. While I will not take the names of people at the bottom end of the spectrum, the top 5 Left Liberals, at the front end are Ram Chandra Guha, Pratap Bhanu Mehta, Shekar Gupta, Ashutosh Varshney, & Siddharth Varadarajan. As much as I disagree with their views and what they stand for, I have to admit a trace of admiration for their intellectual horsepower. Considering that all of them are regular columnists who participate regularly in TV debates and are also on Twitter one can get a fair sense of their thinking on various issues and events that confront our nation. In this form of argument, one focuses on fault finding or undermining the opposing hypothesis without ever establishing their own position. Both Jalpa and Vitanda are an exercise in mental gymnastics. Attempts are made to falsify, distort and misrepresent the truth for the purpose of inserting their own deceptive hidden agenda. Here both the parties are open minded and argue for the sole objective of establishing the truth. There is no duplicity or deception. Both the parties are willing to accept the opposing point of view, if they are convinced that other’s interpretation is more correct. The integrity with which both the parties approach ‘ Vadah” can be seen from the fact that Umabharathi, wife of Mandana Misra was appointed as the judge in a debate between Adi Shankara and Mandana Misra. Once the arguments were concluded, (after 18 days) Umabharathi declared Shankara as the winner! Such was the level of objectivity.Also there is absolutely no ego at play during the debates. Having lost the debate, Mandana Misra readily accepted to became a disciple of Shankara. Such was the open mindedness with which debates were conducted, the sole objective being discovery of the Truth. Thanks to the advent of Social media, it is now possible for engaging in debates with public intellectuals of all hues, who chose to be on Twitter and Facebook. The opportunity for expressing one’s opinion in public forum on any topic and engage with other intellectuals has opened up interesting opportunities to understand each other. While before the advent of Social Media, we could chose to keep our opinions to ourselves or only share it amongst our friends or at best write a letter to the editor of a newspaper or a Magazine on any issue that agitated us enough to express our opinion, now with the “share” and ‘tweet’ button, our opinions on events are much more freely expressed. Through the very act of sharing a link on any topic or event, we are giving our view either in endorsement or in opposition. The ease with which this can be done, obviously increased the frequency of our expressing our opinions as well as the number of topics on which we all seem to have an opinion on. The digital trail of thoughts we now leave exposes us even further as every one can observe a pattern in our behavior and easily conclude where we stand on various issues. Surprisingly this has resulted in a loss of objectivity amongst public intellectuals as a majority of them are now adhering to a self-reinforcing pattern of public behavior. Both the topics on which they comment or share their own opinion on various events has become increasingly partisan. 90% of the debates on Social Media fall into the Jalpa and Vitanda category and only 10% in the Vadah. Coming back to the different kinds of arguments mentioned above, I would like to add ‘ Silence’ as another form of argument. In the earlier days a debate meant exchange of ideas physically where both the parties were present at any given time and therefore silence could not be a method of argument. 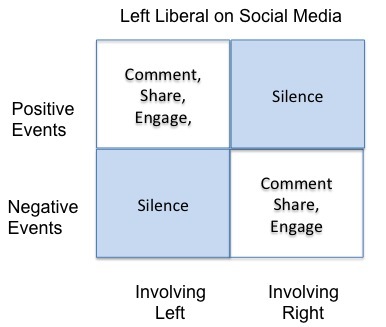 In the context of 24/7 social media where one can participate in a debate with anyone around the world or initiate a debate oneself by making a comment or sharing a link, silence is increasingly being chosen as a method of expressing one’s opinion by public intellectuals of both sides of the divide. Be that as it may, this caveat continues on most people’s time line, perhaps given some legal or historical background that I am not aware off. The reason, I raise it here is that even though RT’s may not be endorsement, silence by someone who regularly expresses opinion on all important events to a positive event that occurs to the side they oppose or a negative event occurs involving the side they support, is an endorsement albeit a silent one. The key qualification I make to the rule is that it only applies to public intellectuals who regularly opine on all current affairs. This will not apply to people who only occasionally express their opinions as a discernable pattern cannot be made and hence no opinion can be formed of their opinions. Let me illustrate this with a matrix. Lets assume that there are two kinds of public intellectuals i:e Left & Right and two kinds of events : Positive & Negative from the perspective of their respective political dispensation. The behavior of a Left Liberal can be mapped as follows. By choosing to remain silent and not comment on any particular event, (in contrast to our expressing an opinion on events immediately before or after an event that we chose to remain silent on) we are communicating something about ourselves and our opinion on a given topic. Silence can be described as a form of argument, where you know the truth, but refuse to acknowledge it, or for that matter, express it in public. The trigger for this blog was the complete silence of Ramchandra Guha to Narender Modi’s speech on August 15. While every Left liberal had some comment to make either on a positive comment with a cautionary rider (Shekar Gupta/Sid Vardarajan or a negative comment (Prof Ashutosh Varshney) Ramchandra Guha chose to stay silent and not comment at all. This is what I tweeted to him when I noticed that his first tweet on the afternoon of Aug 15th (when the whole world was raving/commenting/critquing the speech by Narendra Modi) was on a totally different topic from Mr Modi’s speech. There was something strikingly out of place in his online behaviour that made me ponder over the concept of “Silence” as a form of argument. Such non chalance to the most eagerly looked forward to event bordered on arrogance.It was as if he was cocking a snook at the rest of us. In any event he has still not commented on this speech ! As a person who has chosen to be a commentator on political affairs, I strongly believe he has an obligation to comment on the speech. Here I make a distinction between public intellectuals and party members. While the dharma of a Party member is to uphold their Party view by subsuming their individual opinion to that of the Party they belong to, public intellectuals are not bound by any such duty. Therefore objectivity is a value that they can and should strive for. While they may have formed their political view after due consideration, and therefore need not change the same based on a single event, they must and should react to an event involving the opposing side based on the merits of that event alone and not color it by looking at the event through the prism of their long term view or bias. They should set a standard of objectivity for others to follow and comment on all events (because they are choosing to be a public intellectual expressing opinions on current affairs) and not just on those events which are convenient to their world view. Public intellectuals like Ramchandra Guha, who follow and write about cricket perhaps can take a leaf out of the gentleman’s game and applaud the opposing team member(s) for a winning performance. As a historian, I am sure he has read enough legendary tales of sportsman spirit for him to imbibe this quality. Modi’s speech was flawless and did indeed warrant a positive comment. At worst, he could have added his standard rider on the lack of mention of Muslims. Whether it is the Right or Left we all have our inherent biases. It is difficult for us to publicly acknowledge that we may have erred in forming our earlier opinions. However we are better served to adopt “Vadah” and discover the truth, rather than adopting the tactic, of ‘Jalpa’, Vitanda’ or ‘Silence’. Our digital credibility will greatly enhance. The other options would of course not to pose oneself as a public intellectual. Mr Guha, for example can call himself a ‘lapsed’ objectivist instead of ‘lapsed’ Marxist. No expectations of objectivity then. Today, we the people on the Right are riding high, with Narender Modi seemingly not making any mistakes and therefore not testing our sense of objectivity. Surely a day will come when he will falter, for he is only human. He will make mistakes. There can be no doubt about that, but that should be the day when we must not choose silence as a form of argument.